Within the Jainta hills, the small village of Nongbah relies on terrace agriculture for paddy cultivation. There are no restrictions for individuals tapping into water flows from perennial streams, natural springs, or collection ponds. This enables farmers, nearly 97% of the population, to cultivate paddy, betal leaf, and black peppers in seasonal rotations. Meanwhile, drinking needs are met by perennial springs during the dry months, from October to March. 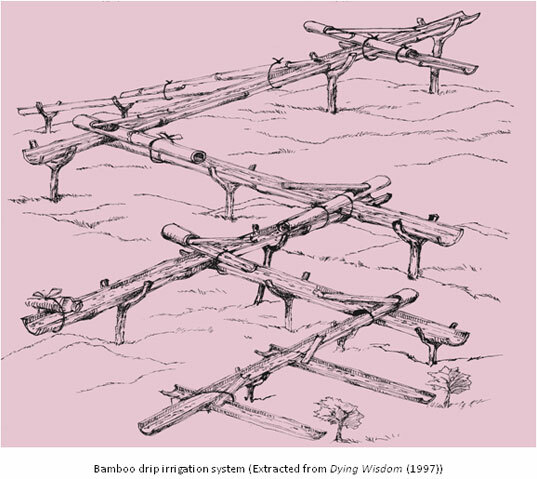 Only during the winter is irrigation required, and the bamboo system is used for crops that need relatively less water. To get started, locate an available water source. Next, select a sloped area of land (at least 30 meters in variation). Then slice the bamboo shoots and forked branches, placing the wider shoots in the first channel and the smaller pipes for the last section (plan for 5 stages). Puncture a series of holes in the shoots, spacing them equally. Ground clearance should progressively descend so that the water may be dropped near the roots of plants in the last section (10-15 cm above ground). To reinforce the structure, tie the pipes and forked braches together using fiber-rich twine as rope. At points of diversion, smaller bamboo shoots may be used to redirect water. Adapting to drier growing seasons, farmers are advised to match irrigation decisions with crop selection. Professor Ramanthan of Tamil Nadu Agriculture University suggests that “during the June to September season … stop cultivation of rice and opt for crops such as pulses, sunflower, sesame and maize. In areas affected severely by drought, [farmers] should go for pearl millet, minor millet and forage crops. However, in places where there is water stagnation, they can continue to grow rice."